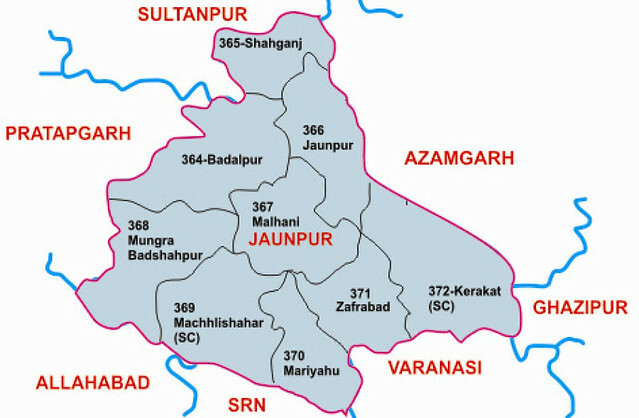 There are nine legislative assembly constituency in Jaunpur district for the 2017 Assembly elections. They are 364 Badlapur, 366 Jaunpur, 372 Kerakat, 369 Machhlishahr, 367 Malhani, 370 Mariyahu, 368 Mungra Badshahpur, 365 Shahganj, 371 Zafrabad. When Uttar Pradesh assembly election 2017 is getting ready to electios new Assembly, Jaunpur is not anywhere behind in the election heat. Jaunpur (Hindi: जौनपुर ज़िला, Urdu: جون پور ضلع‎) is a district in the Varanasi Division in the state of Uttar Pradesh, India. Jaunpur is the administrative centre. It lies in eastern part of state. Jaunpur City is situated at the bank of Gomati river. District have 2 Lok sabha, one Rajya Sabha and 9 Vidhan Sabha seats. According to 2011 census report Jaunpur have 1024 female on per thousand male which is highest in Uttar Pradesh.